Alec Soth is a divisive figure in the photo world, something that comes with the territory when you get a lot of attention in an attention-deprived microcosm or when you become the figurehead for a whole sub-genre of photography. His quirky, folksy attitude may not go down well with everyone, but I thought his collective, LBM's idea to set up a photobook summer camp for "socially awkward storytellers" instead of doing just another photobook workshop was genuinely refreshing. It doesn't sound revolutionary—replacing the campfire with a digital projector to show the other participants images while telling them a story—but I for one would be interested to sit in on a session. Not all photobooks need a strong narrative to work, but there are a LOT that could definitely use it. Perhaps most importantly, it's free. They don't fly you out to LBM Land, but they are not asking you for hundreds of dollars for the privilege of taking part. For more info and to apply (deadline is April 15th), check out the LBM website. Book Machine looks like a great initiative by Onestar Press and Three Star Books from 20 Feb - 10 Mar 2013 at the Centre Pompidou. The event is a FREE workshop open to the public during which you get to make a book. You get a 3.5-hour slot to work with a graphic designer from one of three design schools (ECAL, ENSAD or École Estienne) to produce a final PDF. The final book (in a very limited edition of 1 copy!) will be yours to pick up in "the next few days" at the Centre Pompidou. The book format is 14 x 2.25cm with 100 black and white interior pages and a glossy color cover, although I'm not sure what the printing process is going to be... all of this being entirely FREE. Plus there is a bunch of other book-related stuff going on. So if you have a book idea, sign up here. Hiroshi Hamaya, China as I Saw It [Mite Kita Chugoku]. (Tokyo: Kawade Shobo Shinsha, 1958). In 1956, just before Mao's Great Leap Forward, Hamaya travelled through China to Canton, Shanghai, Xian, Lanzhou, Urumchi and Beijing. As with most of his early work, these photographs focus on the local folklore and people's everyday life. 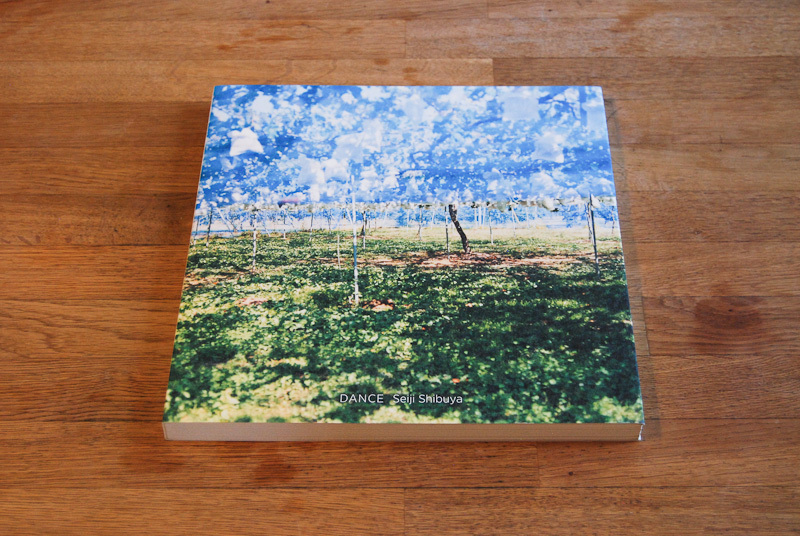 Although it is not self-published, this is one of the most self-made photobooks that I know of. Hamaya took the photographs, wrote the text, designed the book inside and out (which leads to some unusual layout choices) and used his own calligraphy on the cover and for the fantastic end papers (a hand-drawn map of the route he took through China). With the gorgeous gravure printing of the period thrown in for good measure, this is one of those "They don't make 'em like this anymore" books. Naoya Hatakeyama, A Bird: Blast #130. (Tokyo: Taka Ishii Gallery, 2006). I tried to avoid choosing personal favourites for this list, but I have to confess that this is one of them. 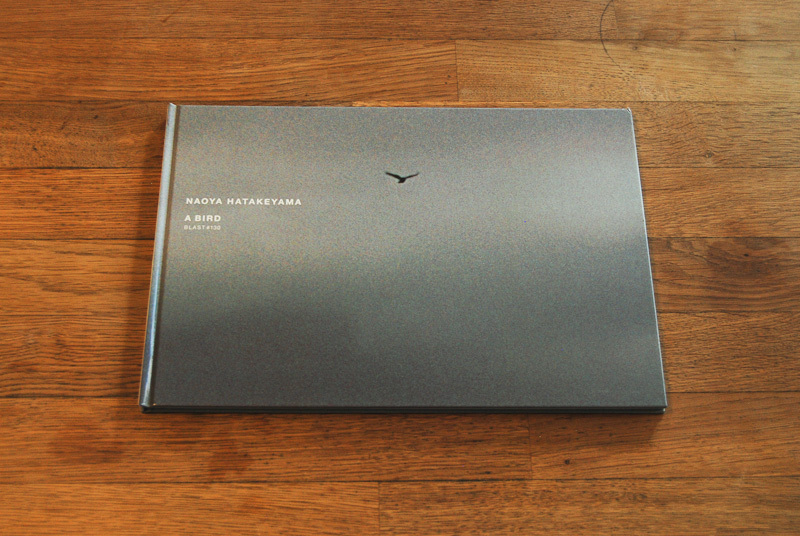 The book is a kind of outtake from Hatakeyama's Blast series on the explosions used in limestone quarrying. The Blast pictures are frame-by-frame deconstructions of explosions of limestone taken with remote cameras in order to get as close as possible to the action. When going through his contact sheets, Hatakeyama discovered that a bird had flown through the frame for the duration of one such blast. The book starts just before the charges are set off and ends as the dust is still settling in the air. Throughout, the bird continues its flight, only adjusting its course slightly in order to avoid the disturbance below. The drama and violent beauty of the explosion is made to feel almost insignificant by this bird flying across the sky. The production of the book is nothing special, but then it doesn't need to be... in a way it reminds me of the flipbooks I loved so much as a kid. As an aside, Hatakeyama's Blast series has, amazingly, never been published as a book, but thankfully that is soon going to be put right. Eikoh Hosoe, The Butterfly Dream. (Kyoto: Seigensha, 2006). Eikoh Hosoe has produced some of the great and most elaborate Japanese photobooks. The first two editions of Barakei and the first edition of Kamaitachi are some of the most sought after books on the market. This book from 2006, devoted to the late Butoh dancer, Kazuo Ohno, deserves to be better known. As with Tatsumi Hijikata, who collaborated with the photographer to embody the kamaitachi, Hosoe photographed Ohno throughout his dancing career until his death in 2010. Hosoe made the book as a gift for Ohno's century of life and it was published on the dancer's birthday. The Butterfly Dream was designed as a companion piece to Kamaitachi, so that each of the two masters of Butoh would have their own. The brilliant Tadanori Yokoo designed the slipcase for the book, just as for the 2005 Kamaitachi reprint produced by Aperture. Mao Ishikawa. Hot Days in Camp Hansen [Atsuki Hibi ni Camp Hansen]. (Okinawa: Aaman Shuppan, 1982). This is the first of two books on Okinawa in my selection. Ishikawa's first book, Hot Days in Camp Hansen is a very unusual beast. Photography was still a male-dominated world in Japan in the late 1970s and a female photographer from Okinawa would have had virtually no opportunities to publish her work at that time, let alone work has uninhibited as this. The book focuses on the girls who worked in bars catering for the American GIs near the US military bases. To do this project Ishikawa became one of these girls herself, working in one bar for a period of around 2 years. The result is an astonishingly frank but joyous and affectionate portrait of the girls she worked and lived with and the GIs who frequented the bar. One of a kind. Kikuji Kawada, The Last Cosmology: Photographs. (Tokyo: 491, 1995). Kawada is known—almost exclusively—for his 1965 book The Map [Chizu], an extraordinary photographic object that now fetches astronomical prices at auction. Whereas Chizu was a kind of mental map of the horrors of the Pacific War, The Last Cosmology is Kawada's personal map of the cosmos. Like many of his books, it combines seemingly unrelated images: long exposure photographs of of the night sky (Kawada is an amateur astronomer) are interspersed with visual fragments that echo the celestial patterns. Less elaborate in its construction than Chizu, like all of Kawada's books, it is still beautifully produced. Jun Morinaga, Kawa, Ruiei / River, Its Shadow of Shadows (Tokyo: Yugensha, 1978). Kawa is a study of Tokyo's waterways as they were slowly being choked by the economic boom of the postwar years. This is a book of texture: Morinaga focuses almost exclusively on the surface of the water, as it bubbles, froths and stagnates in the mud. One of the most remarkable things about Kawa is its design by Sugiura Kohei, the man behind many of the best Japanese photobooks of the 60s and 70s. His use of gatefolds slows the reading process down and draws you in to Morinaga's muddy, claustrophobic, abstract world and the way in which the images are integrated into the pages of text at the end of the book is masterful. Morinaga was W. Eugene Smith's assistant for his Minamata project and the latter contributed a short text to this title. Seiji Shibuya, Dance (Tokyo: Akaaka, 2011). For my money, Akaaka has been the most interesting photobook publisher in Japan over the last few years. Shibuya's previous book Birth, was a little too perfect for me, a succession of achingly beautiful images that didn't really go anywhere. Dance is a much stronger book, particularly thanks to the edit and the sequencing of the images where little series appear and disappear like musical riffs. The book was made from Shibuya's entire archive and the edit took around one year, using some images that Shibuya had apparently forgotten about. The book isn't driven by a concept or idea, but instead seems to focus on conveying a certain mood, a kind of sunny melancholy. This book also has my favourite cover of recent years, not so much for its cover image but because of the thick textured paper on which it is printed which just makes you want to pick it up. Akihide Tamura, Afternoon. (Tokyo: Match and Company, 2009). If most photobooks are novels, Afternoon is more of a short story. With a mere 23 plates of black-and-white landscapes over 32 pages, the book is remarkably economical but very well made... not an ounce of excess fat here. Tamura was one of the photographers featured in the landmark New Japanese Photography show at the MoMA in 1974. My sources (ahem, Wikipedia) tell me that he shot the stills for several of Akira Kurosawa's late movies, but I know very little about him apart from that. I know a little more about the publisher, Match and Company. They are the Machiguchi brothers, a cross between rock stars and book designers. Their books are immediately recognisable—maybe even a little too recognisable—with their clean, minimalist style and they are one of the few Japanese publishers with an eye for roman typography. They have also developed an interesting model, designing, producing and selling their books themselves through their online shop bookshop-m.
Shomei Tomatsu, Okinawa, Okinawa, Okinawa. (Tokyo: Shaken, 1969). Although far less elaborate than those of Eikoh Hosoe, Tomatsu's books have also become some of the most highly collectible postwar Japanese photobooks. Okinawa, Okinawa, Okinawa is a somewhat lesser known title, which, you guessed it, focuses on the islands of Okinawa. Tomatsu has always been fascinated by the Americanization that took place in Japan after the war and in the 1960s he travelled to Okinawa, where the US has maintained a major military presence, to photograph. The islands became a major subject for his work and eventually his home (he has lived there for many years now), not only because of the US military presence, but also for their natural beauty and way of life so far removed from the intensity and chaos of Tokyo. 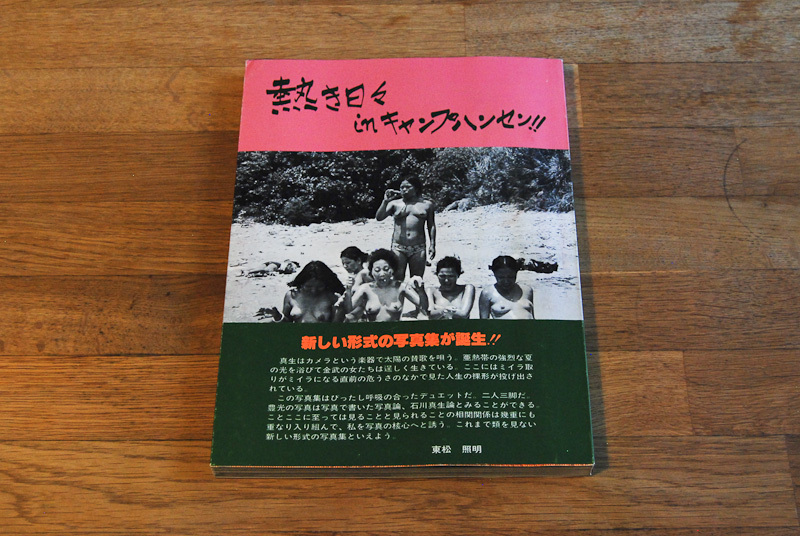 In some ways this is a protest book (the slogans on the cover call for an end to the US occupation of the islands), but it also shows Tomatsu's burgeoning interest in the beauty of Okinawa and its way of life. Some of Tomatsu's color photographs of Okinawa appear in the current issue (#280) of Aperture magazine. Yoshihiko Ueda, Quinault (Kyoto: Seigensha, 2003). In the summer of 1990 while scouting for a location for a fashion shoot, Yoshihiko Ueda, a successful fashion photographer, had a “moment of vision” when he discovered the extraordinarily lush Quinault rainforest to the west of Seattle. Ueda eventually returned with an 8x10" camera and color film to try and recapture the feeling he first had in discovering Quinault. The images in the book are taken at eye-level in very low light to convey the feeling of wandering through this dense forest. The book is beautifully and very subtly printed on a thick matte paper in an oversize format to retain some sense of the imposing scale of the forest. If you are unfashionable enough to appreciate natural beauty, this one is for you. We live in the age of photo proliferation. Digital technology in all its forms (cameras, phones, computers, the Internet) has made photography the most democratic of media, both in terms of making and disseminating images. And they are everywhere, all the time: on our TVs, our computer screens, our smartphones and in our streets. Of course, this state of affairs is not as new as we might think—it has been in place since Walter Benjamin and his age of mechanical reproduction—but digital technology has led this proliferation to take off exponentially. The impact of this is clear, even in traditional, 'purist' photography circles. In 2007 the Musée de l'Elysée in Lausanne created a crowd-sourced exhibition entitled We Are All Photographers Now, allowing anyone to upload their photographs to be included in the show. More recently Europe's biggest photo-festival, the Rencontres d'Arles, centred on an exhibition entitled From Here On, a kind of manifesto for the age of the online image ("Now we're a species of editors. We all recycle, clip and cut, remix and upload. We can make images do anything.") where much of the work was made by artists appropriating or collecting other people's images. Even Elliot Erwitt has been saying that more pictures are better than one. So what a relief to open a photobook (am I allowed to call it that?) 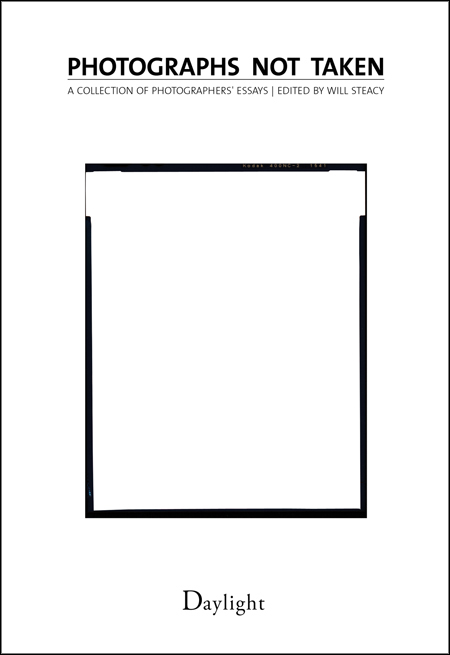 and discover that it does not contain a single picture: the cover's 'empty' frame is the closest thing to an actual photograph. Photographs Not Taken is a collection of essays about photographs that, for one reason or another, did not end up being taken. The writer and photographer Will Steacy, who edited the volume, asked an eclectic group of photographers (Emmet Gowin, Tim Hetherington, Laurel Nakadate and Jamel Shabazz all feature to give you an idea of the mix) to "abandon the conventional tools needed to make a photograph–camera, lens, film—and instead make a photograph using words." The book is both a collection of opportunities missed, of attempts to conjure up in words those images that got away, but also a look into the psychology of the photographer and their ethics, reflexes, and methods. Naturally many of these non-photographs were not taken because of an ethical or moral decision by the photographer, a decision that photojournalists must face on a day-to-day basis. Interestingly, many of the writers contrasted the act of taking a photograph with the state of being present as a human being. In these cases the camera is described as a defense to hide behind, with which to shield the photographer from the impact of the moment happening in front of or to them. The book also has its more surreal moments: Matt Salacuse describes the scientologist jedi mind trickery of Tom Cruise forcing him to lower his camera and to pass up the opportunity of photographing Cruise and Kidman's newborn adopted baby. It must be said that the essays are uneven... after all this is a collection of texts by photographers and not by writers. I found that some of the texts failed to bring the images to life, or perhaps that too many of these images ended up 'sounding' the same. For me Roger Ballen's essay stood out: he avoids any explanation of why he didn't photograph the scene he describes (did he even have a camera with him on that day? ), but there is no question whose world this lost moment belonged to. Rather than in attempting to resurrect lost images through words, an exercise that surely would be better accomplished by a group of writers, I found Photographs Not Taken to be most successful when it makes the reader think about the decisions that go into making, or not making a photograph. And if it encourages us to put down our cameras from time to time, that can only be a good thing. Note: The International Center of Photography in New York will be hosting a book signing with several of the contributors on Friday, March 23rd from 6:00-7:30 p.m.
Will Steacy (ed. ), Photographs Not Taken, (Daylight, 2012). It will soon be the first anniversary of the huge earthquake and tsunami that devastated Japan's Tohoku region. Hundreds of thousands of images have been taken since the disaster and most of these naturally focus on documenting the scale of the devastation. In my view, little interesting work that goes beyond straightforward visual description has emerged as yet. One of the strongest projects started up immediately in the aftermath of the disaster when the photographer Aichi Hirano decided to distribute disposable cameras to the people in the shelters in the devastated region. He retrieved the cameras, developed the film and published the results at www.rolls7.com. I have written about the Rolls Tohoku project before on the blog and Hirano has continued to add new images to the Rolls website since then. This week, I discovered another project which is a fascinating companion to Rolls Tohoku. The Memory Salvage Project was started two months after the earthquake by a team of young researchers from The Japan Society for Socio-Information Studies who felt the need to return the photographs which were swept by the tsunami to their owners. A group was set up to gather photographs that were retrieved after the tsunami, to clean them, digitize them, and to attempt to return them to their owners. This could seem like a herculean and perhaps misplaced undertaking given the scale of the problems that people face in the affected areas, but I think it is a wonderful reminder of what photographs can mean to people and how closely they are linked to our memories. An exhibition of some of the retrieved images took place at Akaaka's gallery in Tokyo earlier this year and, for any readers in Los Angeles, a second exhibition at Hiroshi Watanabe's studio is taking place from 8-25 March. Details are on the Lost & Found website.